Now Yumi must brave the wilds of an unknown moon until her rescue mission shows up. If it ever does. Starship journalist Yumi Minamoto’s hot temper makes turning around her poor reputation an impossible challenge. While on a mission with her brother Shintaro to investigate a neighboring colony, her vessel comes under vicious attack, leaving her bleeding and disoriented. During the battle, Yumi’s boss hands off a data device with secret, valuable information inside, just before her escape pod slams into a nearby moon. Clinging to life and desperate to find her brother, Yumi and her fellow survivors emerge into an alien civil war with unknown agendas and honor codes. As she’s captured and used as a pawn in negotiations, the journalist has a hunch something on the device could help her and the crew… if only it hadn’t gone missing during the crash. Can Yumi use her truth-seeking skills to ally with the right side and recover the data before her life is torn apart in a battle for planetary supremacy? 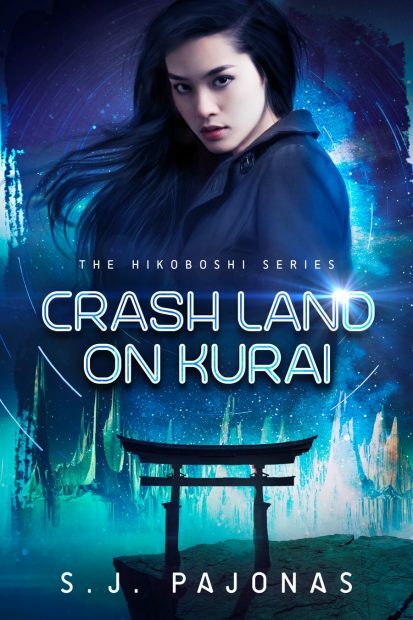 CRASH LAND ON KURAI is the first book in the fast-paced Hikoboshi Space Opera Series. 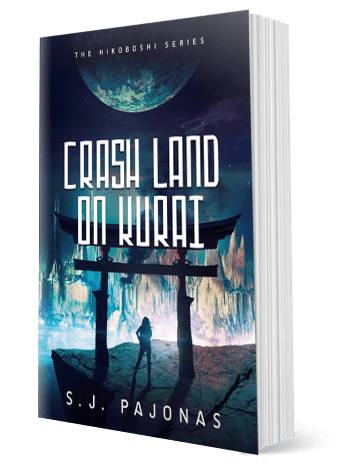 If you like high-tech futures, ancient Japanese honor codes, and character-driven action, then you’ll love S. J. Pajonas’ thrilling sci-fi adventure. Rating: Rated R for language (profanity), sexual situations, and violence. Kazuo and Gen sit and divide up the supplies, turning out the medkits and fashioning them into backpacks with some of the chair straps we stripped from the life pod. Ryoko and I sit around the campfire, chewing on smoked protein strips, munching on freeze dried berries, and drinking water. “Will you be okay traveling alone with him?” I whisper to her. My lips quirk as I remember her interview. Ryoko always did play by the rules, and she knew them backwards and forwards. No need to learn them yourself if she’s on your team. “Ew!” She chucks a freeze-dried berry at me.